1. 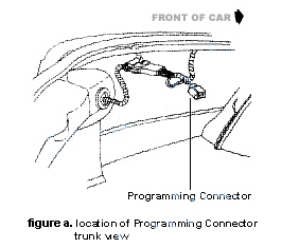 Before you start programming the remote you need to have the access to the program connector which can usually found in the driver's side of the trunk (a plastic connector with two wires leading up to and not connected to anything). You may also have to pull the the trim back to access it. 2. The connector should have atleast 2 terminals. Use a jumper wire to connect both terminals. Locks will cycle, meaning you've entered the programming mode. Leave the jumper connected until step 5. 3. Press any button on the remote once. Door locks will cycle to confirm. 4. To program another remote just press any button on it as well. Door locks will cycle to confirm that it has been programmed. 5. Turn the programming mode off by removing the jumper wire from the connector.